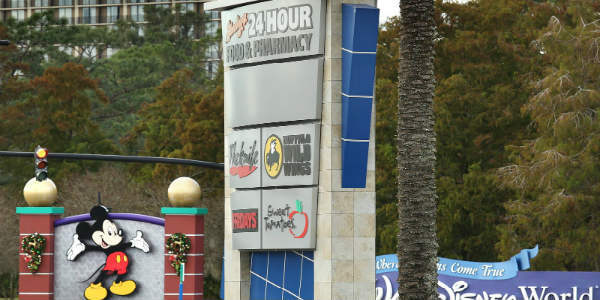 After 20 years of operation, it looks like the Crossroads of Lake Buena Vista shopping center will be closed to make way for new ramps planned for the I-4 Ultimate Expansion project. The Florida Department of Transportation (FDOT) is currently negotiating to buy the Crossroads, according to Growth Spotter, and they have the lone appraisal of $145 million for the property. FDOT plans to eventually reconfigure an Interstate 4 interchange at State Road 535 with a design that would require demolition of the shopping center. The project’s current design includes a feature that will take some traffic on a loop ramp that connects with Hotel Plaza Boulevard, the road leading into Disney. That ramp, an exit and drainage ponds would go on the Crossroads land. Opened in 1998, tenants have now been told that they may need to vacate their buildings within 18 months. But the chances of them finding another location close to Disney will be difficult, though they would be given assistance in relocating if the deal goes through. Many of the tenants have only been open 2-3 years, and it looked the shopping center was thriving. I know I visit several times a week for quick meals out. What do you think of this? Will you be sad to see Crossroads go? Let us know in the comments.